On the weekend of his 100th birthday, it was the next best thing to having Larry Itliong there. We didn’t have a special Ouija board, just a cassette tape with his voice. At a symposium in his hometown of Stockton, California, the Filipino American National Historical Society unveiled excerpts of a “lost” tape of Itliong made during a seminar with UC Santa Cruz students a year before he died in 1977 from Lou Gehrig’s disease. In a previous AALDEF post, I wrote how the lecture showed Itliong still had the “fire for the fight.” He was tenacious and encouraged Filipinos to stand up for their rights. Itliong, however, refused to sell out Filipinos. In the last part of the lecture, Itliong also mentions for the only time during the seminar the man who overshadowed his legacy, Cesar Chavez. But he begins by dropping some other famous names. Chicago’s tough boss Mayor Richard J. Daley? Itliong, a tough boss-type himself, liked Daley. Itliong liked to refer to himself in a self-deprecating way, using the term Igorot, an indigenous mountain people of the Philippines. The truth is there weren’t many. But Itliong’s fearlessness commanded respect. Itliong should be famous for being fearless in his saying no. He knew he didn’t have to go along with the powerful. And if he was offered money, he says he didn’t hesitate to turn it down. But then he described the conditions. This was after he left the United Farm Workers union early as a VP to Chavez. It was as if the union acknowledged Chavez needed Itliong to unify the two biggest groups in the fields, the Mexicans and the Filipinos. He said young Pinoys with him were amazed at the time by his refusal. Itliong said it wasn’t an isolated instance either. “I said, yeah, but he’s not my candidate,” Itliong said. But they came back. “All you have to do is say in public you support Hubert Humphrey.” Itliong said. “That’s all they wanted me to do. But I didn’t do it. Because I already made my commitment to a particular candidate. Itliong didn’t identify the candidate. In his later years, employers, even the Catholic Church, wanted to buy Itliong to be a consultant. But the way Itliong saw it, he was a man of principle who couldn’t be bought. It was the highlight of the last segment and impressed the students. It impressed me even today. Hearing the tapes again at their first-ever public showcase practically moved Debbie Paganiban Louie to tears (see her interview at https://amok.com). She’d only played the tapes twice 37 years after she recorded her UC Santa Cruz seminar in 1976. But the lessons were already deeply ingrained in her from the start. “His courage and wisdom in fighting for equality and justice for Filipinos and workers everywhere should be acknowledged widely and revered for all time,” she said. 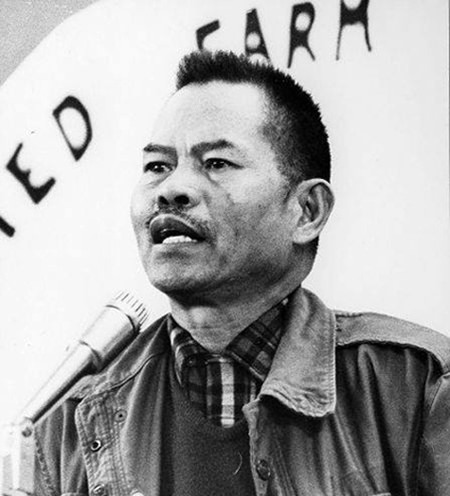 It’s been said that historians and journalists overlooked Itliong and looked uncritically at Chavez, because of the latter’s charismatic sense that came from adopting the non-violent tactics of Gandhi and Dr. King. That was a stark contrast to a battle-hardened Itliong, who saw decades of often violent racism in the fields but who still evolved into a principled union man. But Itliong revered and respected workers, and he leveraged it cunningly through the force of the labor strike, simply by knowing the power of saying no. The record will soon be amplified. Chavez needed Itliong to show him the way.